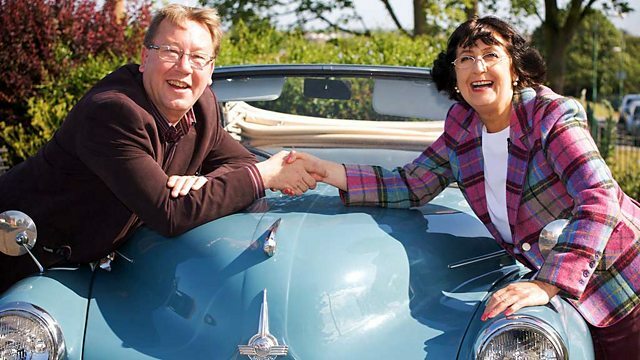 On the second leg of the antique experts' road trip, Thomas Plant learns about one of the UK's great inventing families and Anita Manning finds out how America got its name. -..and a goal - to scour Britain for antiques. You are kidding me on. Thomas Plant and Anita Manning. Thomas, the beginning of our second leg. It's an unearthly hour. The skies are grey, but there's sunshine in our hearts. -I'm all a-bristle with the frisson of excitement. -Tingling in every part of me. -Ooh, steady on, old boy. Dapper, debonair and full of boyish charm is Thomas Plant. His passion for antiques buying is boundless. -Sod this, I'm going to the Alps. is his Road Trip partner, Anita Manning. She's an experienced auctioneer who just can't resist a compliment. Must have been a really lovely little lassie when you were younger. -Well, I'm a lovely wee lassie now that I'm old. to a miserable £149.44, poor girl. We'll get less than what we started with. Are we going to have to be a wee bit canny today? and bag some bargains in this sunshine-yellow 1968 Lotus Elan. -I'm not used to grey skies cos I come from Scotland. And it's always Mediterranean climate in Scotland. in Chiswick in West London. -I'm heading to Bristol. My city. to squeeze a little bit of lunch in with my mummy. -Oh, you're going to visit your mum? -Thomas, keep your mind on the job! onto the mean streets of the Cotswolds town of Tetbury. but how will the Queen of Antiques get on here? -I know. I've got my hat on. If I drive fast enough, I won't get wet. Top Banana Antiques Mall. But will she make more than peanuts in here? Time to meet owner Julian. -This is a huge place with a labyrinth of rooms and corridors. Anita is having a good nosey, but what's on her mind? or I could go down really quite low and I don't want that to happen. I want to make profit this time. -you ought to try and buy something. -I'm quite interested in this dragon. I can't see it properly. I'm going to get Julian to get it out and let me have a proper look. and I wondered if I could have a closer look. Do you know, Julian, I feel like a kid in a sweetie shop in here. -Let me get it out for you. -If we're selling this by weight, we're going to be fine. -Is it 18 carat gold? -Ah, right. I thought he was quite splendid. -I think it's probably for fruit or something, I could expect. -First part of the 20th century. -Yes, I would think probably 1920s, '30s. and would have been used in Buddhistic religious ceremonies. He has a price of £30. -I actually think we would be happy to take £20 for it. Put your hand there, sir. That's wonderful! A third off straightaway, eh? -That's a great bargain without even a haggle. -Great, yeah. I like it. -Let's hope it will roar into profit. -Now, anything else catch your fancy? -I know what this is. This is a SylvaC dog. were made in the 1930s and they were very, very popular. But I haven't seen a teapot and this is a teapot. So it's quite an unusual piece. erm...this dog's nose. And I think that that's a lot of fun. and because it's a wee bit unusual, I think I might have a wee blast on it. He thinks I should have a nice cup of tea as well. Julian! There's no ticket price, so what can Anita get it for? -There's a lot of "verys" there. -It's just because they're not popular anymore. -Och, let's go for it. I think Anita's charm has paid off here. Now that I've bought the teapot, can you make me a nice cup of tea? Look at that. It even pours. And cheers, Anita. Fantastic. -It's been a great pleasure. -..and the old dragon, also for £20. on the outskirts of his hometown, Bristol. who settled there in the 17th century. who split from the established Church of England. to kick-starting a billion pound industry. His guide is local man, Alan Freke. -I'm a local boy. I'm a Bristol boy. And here we are in Frenchay. what are you going to learn me about today? -The Fry family, who were famous for making chocolate. when their drinking chocolate was sold as an alternative to alcohol. of a solid chocolate bar to eat. but they were all dry and crumbly. melted in your mouth. Perfect. and saw on the shelf a bar of tea, would you buy it? that made life sweet for the Quaker business. Here in Frenchay is one of those original 1851 bars. -And those are the ones they gave away? -I imagine they would give small samples. But that would have been part of a display of bars. God, the thing about chocolate, it doesn't go off, does it? Well, that still smells like chocolate. -And it's got a bloom on it, which chocolate tends to get. became a British, and then global, best seller. were the first people to make a chocolate bar? high levels of care, which were advanced even by today's standards. paid for by Fry's for employees who were ill to be put in, and so on. and an industry which is now worth nearly £40 billion worldwide. Thank you very much, Alan. It's been... It's been so enriching. And I'm going to go and eat some chocolate. Thank you very much. Hope you enjoyed your visit. Anita has also made the journey south from Tetbury to Bristol. than the silver-haired and silver-tongued Michael. And you're more prettier off-camera than you are on. -Oh, you're the type of man that I like. Enough of the flirting. Let's get down to business. -Does my bum look big in this? No. But your head looks small, Anita. Uh-oh, Michael's going to have a go. -I feel like Fred Astaire. -That's very good, that's very good. Oh, it's all going a bit Strictly here. Not so much Fred and Ginger as Laurel and Hardy, perhaps. Well, these I usually sell for £35. But there's a rather battered box that goes with it, and it's £35 too. I would really be wanting to pay roundabout £30 for the two of them. -£30?! But... But bejesus, £30? -She's from Scotland, not Ireland, Michael. -Throw me out the shop. I'll tell you what I'll do for the two. -OK. Leave them and we'll think about that. So, what else can Anita find? and it's not long before she's got Michael hunting high and low. -Could I see that one there? -I want you to be careful. -With the price or getting them down? -Both! This is quite a nice one. -OK. I think it's probably Italian glass. Well, it's like Murano. It's Italian, isn't it? Yep, Murano glass comes from the Venetian island of Murano. and crafted glass since the 7th century. Look, put him down, Anita. Is it within the realms of reason for me to buy these for £30? I'd do you them both, right, seriously, for £75. -That's the hat, the hatbox and two of those. -£75? Could you come to 70? It was just an idea that flashed through my head. -The two lots for 70? -Aw, thank you very much. You're a darling. -I know. And the hat's funny. -I had great fun with the hat. -Are you sure you're married? So, after all the mutual flirting, a deal has been struck. and £35 for the two pieces of Murano glass. That's £70 that she's got off the asking prices. Meanwhile, what is Tomboy Plant up to? and I've rang my mum and it would be rude not to pop in and see her. So I'm going in for a fleeting visit, a spot of brunch. I feel I need a bit of energy, a bit of home loving. Just before I start shopping. and you'll always believe it. -You're just in time for lunch, Tom. -Oh, wonderful. A bit of lunch. Hello. Look at this, Tom's mum, or should I say Alex? -Oh, that's tough love for you. so we can see young Thomas as a kid. He was a lovely little boy. He was very kind to his sisters. Um, and he was a delight. who would hang round your leg like a limpet. He was always, "Right, bye, Mum! Thank you, off we go." And does "Mam" have any tips for the grown-up Thomas? -maybe get a few tips from her. I certainly will, Ma. Thank you for that advice. for a spot of antique buying at the aptly-named Odds And Todds. -Jay is here to serve him. I don't know whether he's Odd or Todd. Crikey. There's lashings and lashings of stuff here. Oh, my gosh! There's a downstairs as well. How does he cope with all of this? I've found a cabinet full of stuff! I love this. Is it for your talcum powder? It's for your dressing table. which you obviously fill up with something. Let's give it a sniff. if it smelt of a scent of some description. But what a strange-looking object. -Do you mind if I just pull a few things out, Jay? -A little christening set. It's quite sweet, isn't it? -You've got this maker's name, Bernard Instone, here. Known for doing this lovely handmade silver with a bit of enamel on. -It's quite sweet, really, isn't it? -Yeah, it's a nice little piece. Hmm, very nice. But what else have you got? -Um... I've got a maritime theme. -With a little fob compass. What do you think these are? Do you think these are...? -I thought they were egg cups. -I think they're egg cups as well. And then we've got the Stirling Castle, the marine vessel. This is an ashtray. This is in chrome. -as a nautical theme, doesn't it? -It can go together, can't it? And this is just mad, but it's proper, isn't it? A nice bit of Deco for some reason. Thomas is going to add up all the ticket prices on all the items. -22... 32... 40. Gosh, my maths is good today. -is some kind of discount from Jay, eh? -I know it's not the big bucks. -No, it's the nice little bits. -35 quid, how's that? It'll be done. -That's lovely. Thank you very much. -Thank you. That's really kind of you. -I can't argue with that. No, I definitely wouldn't argue with that, Thomas. and £8 for the maritime lot. and the end of a bit of a skive for Thomas. Will the tables get turned tomorrow? You'll find out very shortly, so night-night, you two. and Anita and Thomas are heading to Bath. But Thomas' thoughts are of home and dear Mama. Yesterday, I popped in to see my mother. I thought you were supposed to be working, Thomas? I know, I know, but I couldn't resist it. -Popping in to see your mammy. -And, um, she gave me a decent bit of advice. -Will you share it with me? -Yeah, I will share it with you. -She said, "Listen to Anita." Well, my advice to you is to spend as much money as you possibly can. -Really? As much money? Oh, no. Let's just remind ourselves how they got on yesterday. and eating lamb, he only spent £35 on three items. leaving him with £127.66 for the day ahead. and she spent a further £110 of her budget on four items. leaving her with only £39.44 for the rest of the day. and have arrived in the beautiful spa town of Bath. Yesterday, my mother said, "Take Anita's advice." Anita's advice this morning was to spend big. run by an old friend of the Trip, Alex. -Yes, well. Doing the dusting. You can't get the staff these days, you know. Thomas has been here before, so it means no messing about. Aha! It looks like he might have found something. I found this hardwood Oriental screen. It's quite decorative. and then at the top here, you've got two...looks like crowns. And then here, you've got the lion and the unicorn of our coat of arms. So you've got British coat of arms. So it leads me to believe that this is sort of Empire-ish, isn't it? Very much so. The product of an Empire upon which the sun never set. It's got a few cobwebs on it. -Well, we keep those to make people think that it's authentic. With a ticket price of £85, it's time for a cheeky Thomas offer. that I'm not trying to be offensive - any more than 30 quid. Well, £40, you've got a deal. That's a really kind, kind deal. £40 it is then, done and soon to be dusted. to the very posh Claverton Manor, that houses the American Museum. than looking at some of them? Here to meet Anita is curator Laura Beresford. -Oh, hello, Laura. It's so exciting to be to be here. was founded by two Americans. and his life-partner, the American oil heir and philanthropist, Dallas Pratt. that is its crowning glory. Well, of the two of them, Dallas had the chequebook. John had the eye. that were printed before the year 1600. So we're talking about the first great age of discovery, exploration. And so you've got America changing shape. So his passion and his collecting bug had to do with maps? He talked about having the map bug. But the bug first bit him, not in America, but in Paris. on display and one of the maps is this one here. Pratt's aim was to rediscover America through antique maps. of the geographical knowledge, history and beliefs of the time. -This map here is more recognisable. But an adventurer should be young, glamorous and handsome. But what's this...? Where did the word "America" come from? Because that all came about because of a fantastic muddle. he received the credit rather than Columbus. because he was so good at telling tales promoting himself. people latched on to it. as the notes on this map make clear. It's Columbus, it's Columbus who discovered this new land. But no-one's listening because America is such a great word. We have these giant crabs squeezing poor sailors. We have whales with huge tusks. I mean, these are just the scariest, the scariest of things. seen off the coast of Iceland. and suddenly a whale breached beside you? it absolutely made sense that things like this could exist. and unique insights into the beliefs of the 15th and 16th centuries. And when I think of today... How do we find our way today? and how poor that is, compared to these wonderful maps. Laura, it's been absolutely wonderful for you to show me round. So, from a map of the world to one of the UK. here in Marlborough Parade Antiques Centre? -Pleased to meet you as well. Who's the dog? -Eric's got his own shop down the road. Can Eric help Thomas sniff out a bargain? it looks like Thomas might be on to something. That is cool. Good ring tray, that, isn't it? Silver mount round there. Date letter for London, 1913. It is, yeah. CB and Sons. from the turn of the century. the white marble-type material, and lapis which forms the blue inlay. -No, it's £35. That's still quite a lot. Only £35? We'll see about that. to see if he can squeeze a few more pounds off the price. -I've got to make a living, son. -I know you've got to make a living. And this dealer's got to make a living. I know the dealer's... But it is slightly damaged. if it was undamaged, if it was unmarked. I'm going to live with this, whether I like it or not. -That's all I can do. So, £30 for the pin tray it is. That's Thomas' final item bought. But will it turn out to be the best in show or a bit of a dog? Anita has hit the road again. She's travelled ten miles north-east to Corsham. She's heading into the Curiosity Shop. -Is this your lovely shop? -It isn't, actually. It's a friend's. -Is it your shop, wee girl? -And are you helping today? The boss is Emily. Helping her, is Anne. It doesn't take Anita long to find something. I've got a herd. I've got three horses there. Chestnuts. Would you say that was a chestnut? This one is called the Spirit Of The Wind. That must mean that it's a thoroughbred. And they can run very, very fast. if she can get a deal on the Spirit Of The Wind. -The ticket price is £20. -I do like this horse. It is Royal Doulton. That's a good factory. But this is a fairly modern example. Well, er... How about 14, Anita? -Because that's dropping it quite a bit. Could you come a wee bit more, say, to ten? -Would you like to ask your mummy? Emily needs to go and check the price with her mum, who's upstairs. -Emily, I think we've got a deal. Thank you very, very much. And thank you, Mum! So Mum's word is the word. £11 it is. Anita's shopping is all done. Both she and Thomas now have bought their lots. Let's remind ourselves what they've got. This gaggle of goodies cost a total of £105. All in all, Anita's spent £121. So let's hear what they think of each other's purchases. He bought quite well. Bought a nice little maritime group. Now, we've got Cunard stuff there and that's the magic word. People want anything associated with the Cunard line. Her Oriental item could do tremendously well. And if that takes off, well, I'm in her dust. It could be my lucky day. Auctions are a funny thing. It's all to play for. With five items each, then, it's off to auction in Chiswick, West London. and how they will fit into a London auction? -Well, the thing is, Anita, I was meant to follow your advice. -My mother said to me, "Thomas, listen to Anita. And I listened to you and I listened to my mother and I took none of it. I know. Well, you were quite right too. it's time for today's auction at Chiswick Auctions. -Well, here we are. Our auction excitement. what about our duo's wares? Anita, my feeling is she's played it a bit safe. It's just a little bit pedestrian, if one's honest. I really didn't know what it was. I can't say I've ever seen anything like it before. It's got a really good Art Deco feel to it. and there are fingers poised on mice for our internet bidders. Let's get this auction started. Yes, first up, it's Thomas' lovely Art Deco powder shaker. William thought you might do well with it. Once we start this, £20 for this piece to go? -£50 on the table here at 50. It's all right. £50. You all done and finished at 50? 55 over there, new bidder. Shake your money-maker, Thomas. That's a great opening profit. You deserve a wee kiss for that. Next, it's Anita's Spirit Of The Wind horse figurine. £28 for that little horse. -40 in the room. At £40 in the room, anybody else? -£40. I'm happy with that. I'm not just happy, I'm delighted. and given Anita a solid start too. Now it's Thomas' maritime set. Will it sink or swim? Start me £20 the lot, please, to go. 20. Straight in at 20. 45. £45 here. £45 with Howard then. Anybody else then? £45 here. Never listen to your mother. That's another inspired buy by Thomas. Enter the dragon. Will the brass bring gold? £40 for the brass dish. £30 then, surely? -Oh, dear. No interest? Nobody interested? 45. 45 to my left. No? £60 then. Far left then at 60.
but the incense burner took centre stage and a tidy profit. -Don't count your chickens before they hatch. Can the christening set keep up this great run of profits? £20, please, to go. 20 is bid. £30 is bid there. At 30. Anybody else then for the silver? At £30. It goes for 30. Not quite as good as the previous lot, but still a profit. Next, it's Anita's doggy teapot. Will it stray into profit? Where shall we start this little jug there? £20 to go? £10, then for the jug. £10, I'm bid. 16. £16 it is now. £16 for the jug. £16. Oh, dear. That's a loss. I think I'll just burst out greetin'. Do you know what that means? -Dissolve in a flood of tears. Now it's the silver and alabaster pin tray. Thomas has high hopes for this. £20 for it. 20 is bid. Nice little thing. At £35. You all done? 35, I'm selling it for. Sadly, not quite what he'd hoped. Are the profits starting to slow down? By my reckoning, Thomas is in front. But a good profit here could put Anita ahead. I can see loads of glass collectors here. Probably some of the most famous glass collectors in the world. -You're shooting me a line. Start me £20 for them. 25. £25 in the corner. At 25. No, £30 then. At £30. Are you all done and finished then? For 30. Ouch. That glass didn't shine for our punters. We're in the home straight now. Can Thomas' final item seal victory for him? £10 for the screen. I'm bid ten. 16. £16 in the distance. Do you want 18? No. -I thought that was a lovely wee screen as well. That's a bad loss for Thomas and it puts Anita right back in the game. It's the roller coaster ride. We feel wonderful and then, all of a sudden, we're down. One more lot to go. She needs some big numbers here from the hat to come out on top. -What's it worth? Start me £20 for a top hat? £20 to the left. 22. My left then at 40. Anybody else for the top hat and box at £40? It's a profit, but is it enough? Yeah, let's go and do the sums. -And have a cup of tea. So, where does that leave our pair? and ready to rise afresh tomorrow with £211 to spend. Well, Thomas, I think we should not be too unhappy about the results. and off to the races with all our money? I think probably a wee cup of tea's more like the thing. -..and Thomas proves to be a safe pair of hands. And I break it. I drop it. On the second leg of their road trip, antique experts Thomas Plant and Anita Manning are travelling round the south west of England. Thomas learns about one of the UK's great inventing families and Anita finds out how a mistake on a map resulted in the naming of America.